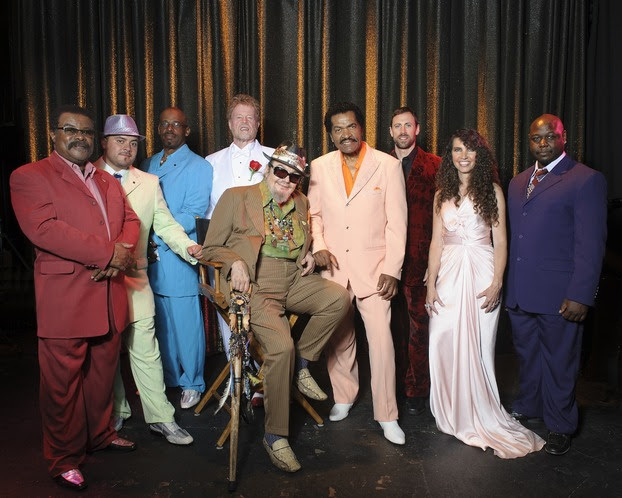 Louisiana music legends Bobby Rush and Dr. John, two of the most colorful figures in the blues, have known each other for more than 50 years. They met as young men in their 20s on the early 1960s R&B circuit and have remained good friends ever since. “When they’re telling stories it’s hilarious because they’re talking about bluesmen so ugly they had to turn their backs to the audience to play guitar,” says mutual friend Carl Gustafson of the Southern California band Blinddog Smokin’. “And in some cases running from the same women.”Yet despite their decades-long relationship, Rush and Dr. John had never recorded together until this year’s “Another Murder in New Orleans.” A collaboration between Rush and acclaimed Funk band Blinddog Smokin’, the track was cut in New Orleans in 2012 around Mardi Gras. The setting inspired Gustafson to ask if Rush’s old friend might want to guest on the song, which the 73-year-old Rock and Roll Hall of Famer — whose real name is Malcolm John “Mac” Rebennack Jr. — eagerly did.“We come up as kids together, man, but I never even thought about recording together before,” says Rush, a chitlin’ circuit legend who is pushing 80-years-old. “How great is it that this late in the game we can do something together while we can still talk about it and smile about it and laugh about it? It came to pass, and I’m so proud I did this with Dr. John.”The song that finally brought these two masters of the blues together is the first single from Decisions, the first album teaming of Rush and Blinddog Smokin’, due in stores April 15, 2014. As with “Another Murder In New Orleans,” Decisions is also the culmination of a long friendship rooted in the blues, this one between Rush and Gustafson, who both became obsessed with roots music early in life.Rush, born Emmett Ellis, Jr. in Homer, Louisiana, started playing in his early teens, changing his name out of respect for his preacher father and fronting, for a time, a band that featured a young Elmore James on guitar. In his 20s, Rush landed in the booming Chicago blues scene where he bumped up against Muddy Waters, Howlin’ Wolf, and, most notably his back-alley neighbor, blues harmonica great Little Walter, whose example inspired Rush to master the instrument. In the ’80s Rush relocated to his current home of Jackson, Mississippi, where he embarked on the hard-touring career that has earned him the title of King of the Chitlin' Circuit, according to Rolling Stone magazine.Meanwhile, about the time Rush was making his name in Chicago, Gustafson was learning the blues in, of all places, Laramie, Wyoming. He ran away from home at 16, making it as far as the railroad tracks and the Pic-A-Rib Café. Through the owner, Miss Peggy, and her son Ricky, Gustafson learned about African-American culture and through the establishment’s jukebox he discovered the sounds of American blues and R&B, an experience detailed in Gustafson’s 2010 memoir Ain’t Just The Blues, It’s Showtime: Hard times, heartache, and glory along Blues Highway.In 1964, Gustafson started his first band, a James Brown-inspired 14-piece revue called Ali Baba & the Thieves. In 1993 he founded Blinddog Smokin’, which has become a force on the blues scene, playing 200-320 dates a year at juke joints, clubs, and festivals around the world, including Gustafson’s Snowy Range Music Festival in Laramie, and the King Biscuit Blues Festival in Helena, Arkansas, where in 1995 he met Bobby Rush.“Bobby was performing, and I was just mesmerized with his show,” Gustafson recalls. “I met him afterwards, and it’s a weird thing: we just had a connection and struck up a friendship. We started calling each other and checking in on each other, and over the years started touring together. One thing led to another, and we just got this strong bond between us.”Nineteen years later that friendship has finally spilled over into the recording studio, with Gustafson and his band — including drummer “Chicago” Chuck Gullens, bassist Roland “Junior Bacon” Pritzker, keyboardist/vocalist Mo Beeks, guitarist Chalo Ortiz, and backing vocalists Chris White (nephew of folk singer Josh White) and Gustafson’s wife Linda — backing Rush on eleven songs on the album. The leadoff track, “Another Murder in New Orleans” addresses in graphic terms the street violence that has ravaged that city post-Hurricane Katrina, and debuted last Fall at a fundraiser for Crimestoppers. It was written by Gustafson and Decisions producer Donald Markowitz, who won the Oscar for the Dirty Dancing soundtrack smash “I’ve Had the Time of My Life.”“When [Carl] first approached me about singing this I was leery about it because I didn’t want to sing a song that would make people think bad about Louisiana,” says Rush. “But when I listened to the lyrics and the story I changed my mind … wherever senseless violence happens, that’s your New Orleans. You could be in the country, a small town, or Timbuktu …”In September, director Jennifer DeLia and producer Julie Pacino, who is the daughter of Oscar-winning actor Al Pacino, shot a video for the song in the French Quarter that will debut early 2014.“I think it’s important to know that the video and the song have a lot to do with hope,” says Gustafson. “Not just despair.”“Another Murder in New Orleans” and Rush’s morals-seeking title track, “Decisions,” are the rare serious notes on an otherwise light-hearted blues romp that is rooted in Rush and Gustafson’s unlikely friendship. Other songs include “Sittin’ Here Waitin’,” the autobiographical “Bobby Rush’s Bus” about the singer’s constantly-moving tour vehicle, “Funky Old Man,” the rap-flavored “Dr. Rush,” the acoustic jam “Too Much Weekend,” and “Skinny Little Women,” which tackles an issue Rush has been pre-occupied with for some time.“Little bitty woman why you always in the mirror talking ’bout how good you look/You ought to be doing like that fat woman in the kitchen seeing ’bout how good you cook,” sings Rush, who had one of his biggest successes in the ’90s with the album Lovin’ a Big Fat Woman. “It’s a joke-y thing. But if you notice that little skinny ladies all the time they look cute and good and smell good and look good. All that’s good but the big lady has got somebody, too. She needs some lovin’, too.”Decisions comes as Rush continues his late-career emergence from the chitlin’ circuit underground to music mainstream. Having previously been featured in the “Road to Memphis” segment of the Martin Scorcese documentary “The Blues,” Rush enjoyed perhaps the biggest success of his career last year with the Grammy-nominated record Down in Louisiana.With plans for Rush and Blinddog Smokin’ to reunite for national tour dates this year, Gustafson says this is the chance for people who have not already discovered Rush to do so. “I’d really like to see people in the United States take a look at these two characters and see what they have before they’re gone, and feel their power, feel their love,” Gustafson says. “Who knows how long Bobby or Mac is going to last? Now we have a chance. We have the two of them together for the first time in their careers, and they’re two of the rarest characters in American music culture.”Bobby Rush is a current Grammy nominee (Best Blues Album) for his album Down in Louisiana.